Which are real Tube stations? "Some years ago, before the age of blogs and when Mika was nothing but a glint in a conceptual artist's unholy eyes, I came up with a quiz to test everyone's knowledge of London. As a Londoner, I'm often surprised when I watch the news and they refer to a part of London that I've never heard of before. How can I have lived here most of my life and not have heard of an area? I mean, I've never been to Peckham, but I do know it exists. Likewise, I'm often surprised when I look at a tube map and find a station that I've never heard of before. It wasn't a very good quiz, but I was bored at work and it seemed like a good idea. I came up with a list of 20 tube stations. Ten of them were real tube stations and ten of them were made up by me. I emailed the quiz around the office. No-one got 100%. It was a terrible shame, and indeed, some of my co-workers ended up killing themselves. The original quiz has been lost, like tears in the rain, but I've redone it with different options. Here it is: 20 tube stations. Can you tell the real ones from the fakes? Leave your answers in the comments. And no cheating – you're not allowed to look at the Tube map or check Google (and don't look at the other people's responses). You may use only your memory, deductive process and experience. Oh, and the real stations have to be London Underground stations. No DLR or mainline stations. They count as fake stations only. I will supply the answers in the next few days, or when I can be bothered. Good luck." UPDATE - themanwhofellasleep has posted the answers here. Thanks to all who gave it a try. 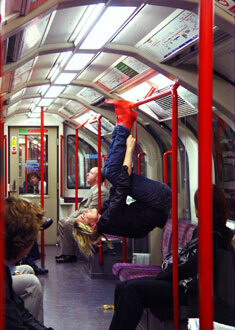 If ever you feel the need to hang upside down from the handrails on your Tube journey, your wait is now over. Dutch born Eelko Moorer, who lives in East London has created some boots that you can latch onto the handrails as he thought it would "liven up Tube journeys". He said: "I like the idea of doing something that gives a person a sense of relief and can cheer up lives. We had a somewhat mixed reaction from other Tube travellers. Some people were surprised, others liked it and others were appalled.." From the look of the guy in the beige suit, some people get their Tube face on and show complete indifference. The boots took him about a week to make and they have been on display at a British Council exhibition in Italy. His objects have been described as "indulging improbable fantasies from flying like a bird to hanging and swinging like a jungle beast". Mr Moorer seems to have had some thoughts about safety as he said: "The soles of the boots were the most difficult. I had to make sure that someone would not fall off,"
However, London Underground weren't too wild about this footwear and a spokesperson said "This is a dangerous and stupid act that could result in serious injury to not only the individual concerned but also other passengers." Not sure I'll be seeing many Tube fashion victims in them as Moorer said "They were meant as a one-off but if someone was interested in a pair, maybe I could do one for them." Probably some bright sparks from YouTube will be putting in an order. Thanks to Dmitri for sending me the link to the story from the BBC. It's worth having a look at the rest of Moorer's work as there's some very weird things going on in his "Emergency Games" booklet. I imagine London Underground won't be using him to illustrate any TfL manuals. Would you cut your nails on the Tube? It's a tricky one for me, as I often file my nails on the Tube and I'm sure as far as some people are concerned I may as well be openly picking my nose. 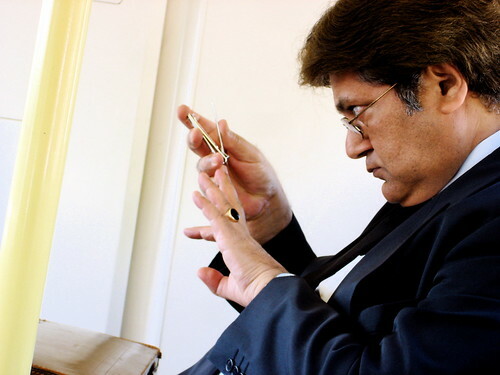 But I think there's something about nail clipping that shouldn't really be done in public. Mainly because the cuttings have a tendancy to fly all over the place. Can you imagine being hit by a stray piece of nail? Thanks to Chutney Bannister for the picture. Have you seen anyone using the underground as a private bathroom or dressing room? Also where do you stand on women putting on make-up on the Tube? Another one of my crimes as well. It's a shame that this might be spilling over to the Tube. 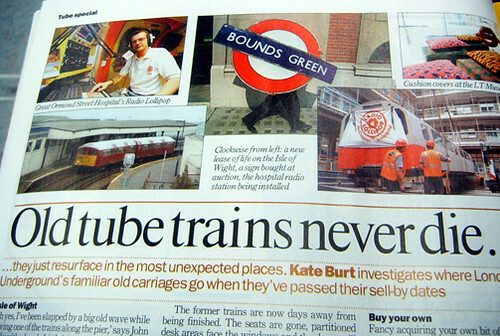 Many of you know that my stock in trade on my sister site www.goingunderground.net has been collecting the funnier announcements that Tube drivers make and The Times' reporter got in touch to see if he could quote some for the article. Over the years hundreds of these have been sent to me and I think most people like them. But apparently "Passengers on many overground lines object to the proliferation in information bulletins. They complain that electronic announcement systems, station staff, guards, drivers and buffet stewards compete for Tannoy time." I must admit that I object to the voice of doom announcements which begin; "Ladies & Gentleman this is a service announcement..." and then when you're getting ready to hear about something of major importance, it's a message about holding onto your bags because there are pickpockets, or that there are no delays. Perhaps it's such a rarity that there are no delays we need to be told about it. What do you think? 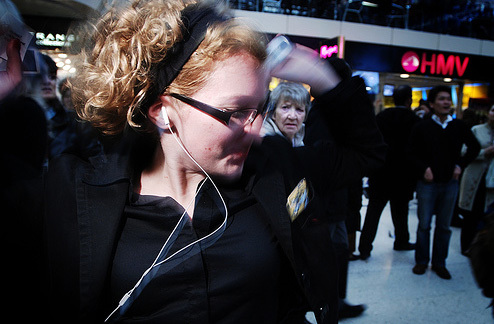 Should the ad-libs such as "What part of stand clear of the doors don't you understand?" be cut. Or the driver who told the "minging" woman to move away from the doors as the hairs on her legs were getting stuck in them. What about a driver who tried to lighten the delay by getting the passengers to pass the time by singing 'Ten Green Bottles'? Have you heard any good announcements lately, and which do you think should be banned? Once again Friday's look at Tube Fashion Victims, TFV's or travellers spotted on the Underground with a style that they've made their own. Only one victim this week. 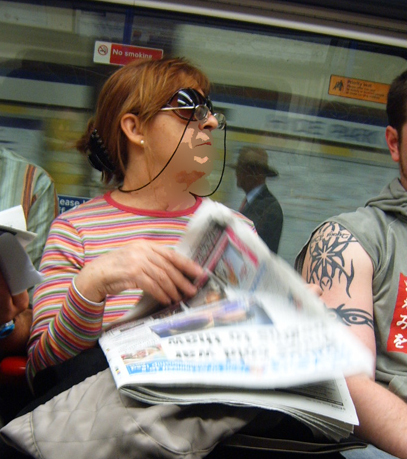 As regular readers know, I really can't udnerstand why people wear sunglasses inside. Particularly people who wear sunglasses on the Tube when they're in a tunnel. Particularly when they're trying to read. Particularly when they need real glasses as well. That's it for now. The previous victim can be found here and the complete picture gallery can be seen on the following Flickr set. 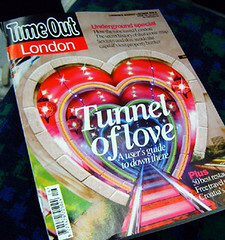 This week's Time Out has a gloriously psychedelic and slightly Ann Summers-like front cover heralding its 11 page celebration of the London Underground. From the lead editorial "As you struggle grim-faced up yet another broken escalator, indulge not the old gripes about the grime and crime. Succumb instead to Underground love....Think too of the men in stovepipe hats who died so that you could make it to work without mounting a Penny Farthing bike". They kindly acknowledge this blog, Geoff's mashed-up Tube maps and Hywel Williams' classic ghost station site amongst Tube websites to bookmark. 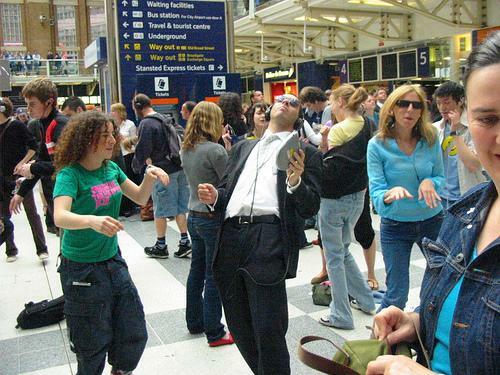 Highlights for me, from this "celebration" are an interview with Tim O'Toole LU's managing director who claims to have "the best job in London by far", despite his stomach clenching "every time we have a signal failure or a train is down". He must take a lot of Rennies then. Diamond Geezer tackling the Tube's shortest journey - Leicester Square to Covent Garden - 50 per cent longer by Tube than at ground level. 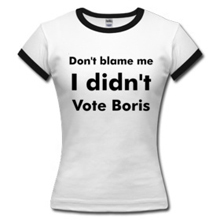 "But it had been the down and up which had devoured my time and not the 45 second Tube ride". I was disappointed to learn that Bumper Harris the one legged escalator tester at Earl's Court was a myth ("The London Transport Museuem has no evidence to back this up") - although I'm still not convinced by this. There's a look at how the Tube measures up to subways in Tokyo, Paris, New York, Moscow, Berlin and er Glasgow. Sadly of the five, Glasgow's has never featured in a film, although it is part of a pub crawl in Iain Banks' novel Espedair Street, where characters have a whisky and half of Heavy at every stop. The "Old Tube trains never die" feature is fun. I knew old carriages put out to rest had made it over to the Isle of Wight and even as office space in Shoreditch. But didn't know that a Jubilee carriage would become Great Ormond Street Hospital's new radio studio. There's a 150 old history of the Tube, a photographic flavour of the ends of Tube Lines and and of course a homage to Harry Beck creator of the iconic London Underground Map. Not included in the "Tube Love" fest (but a good antidote) was Micheal Hodges' Slice of Life feature on drinking to get through a Tube journey. He believes that not only do we stop acting like British people "when we sink down below the city streets, we stop smelling like British people... We have to get drun, it's the only part of our humanity left to us, the one thing that cows and rats can't do and we can". I imagine this was just a happy co-incidence. What I particularly like about the the 21st century dinner party is how people can't help being sucked in. True, at the start there's the normal "Ah there's a herd of elephants running through the Tube, I'll pretend I haven't seen them" Tube reaction. But the tone lightens as more people arrive and just start behaving as if it's a real dinner party - except one where beggars come up to you with notes about their troubled families, tourists decide to take a picture for the folks back home and strangers come in to grab after dinner chocolates. Brings a whole new meaning to the "please consider others when eating food" posters though. Probably not exactly what TfL had in mind. As we get nearer and nearer to warmer weather it's good to hear further steps towards air conditioning on the Tube. Or rather further steps to testing air conditioning. A former coal mine at the town famous for its pork pies, Melton Mowbray, in Leicester is going be the test-bed for new stock. Mark Loader of Metronet said of the former Ashfordby Mine: "The test site will enable us to really prove the reliability of these new trains. We'll be able to simulate six months to a year's service in only one month. That means a more reliable train for Tube travellers when they enter service." If all goes welll, the air conditioned trains are due to begin service on the Metropolitan line from 2009. But this begs the question, are they going to use Londoners or Midlanders as guinea pigs? Who's likely to be a better control group for withstanding heat? 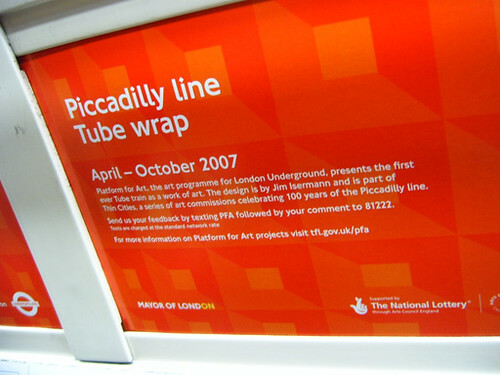 If you're travelling on the Piccadilly Line, look out for some "wrapped" Tube trains as part of the Platform for Art series. I saw my first one on Friday morning and being half asleep I just thought that someone had gone a bit mad with red paint, as the artwork was a bit too subtle for my eyes. Apart from graffiti and those eye boggling trains for Yellow Pages, it's apparently the "first ever work of art to cover an entire tube train". The piece has been designed by artist Jim Isermann and wraps the full length of one Piccadilly line train in vibrant geometric pattern that resonates within London Underground's distinctive design heritage. What resonated most with me was being slightly stumped when I left the train on the opposite side to see a blue wrap. Wonder why the doors are left red? The Platform Art website invites you to leave comments on the art and also rather strangely "a real or ficticious anecdote". Jubiliant RMT leader Bob Crow said "This is the sensible outcome we sought for from the start. Our Metronet members deserve congratulating for standing solidly together to defend their organisation, jobs and conditions and to prevent further dangerous fragmentation." Check out the BBC for the full story and the post below for what the dispute was about. 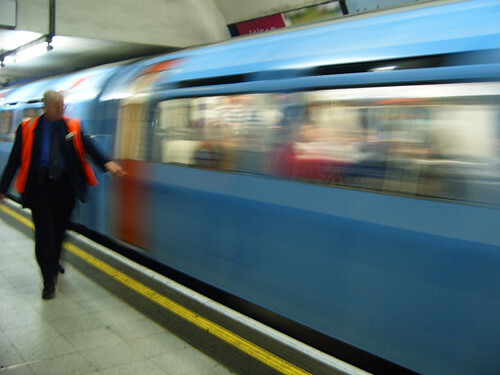 A three day strike by more than 2,000 Metronet London Underground maintenance workers is set to begin at 6pm this Sunday (April 15th) after several days of talks failed to resolve the disagreement. The dispute revolves around plans by Metronet to transfer around 250 workers to train maker Bombardier Transportation as part of an effort to introduce new trains and improve reliability. 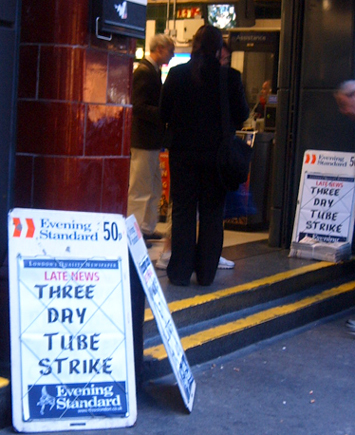 RMT union members had voted by a majority of 750-60 in favour of the strike. Negotiations continued but inevitably failed. Union leader Bob Crow said "It is a great pity that after we suspended the overtime ban scheduled for this week to enable those talks to take place, the company has not taken the extra step towards us that could have resolved the dispute." Metronet's workers maintain the Bakerloo, Central, Victoria, Waterloo & City, Circle, District, Metropolitan, Hammersmith & City and East London lines. At the request of the unions we have reduced the numbers of staff that will transfer to a minimum – but we owe it to the travelling public to push ahead with plans that will improve services. 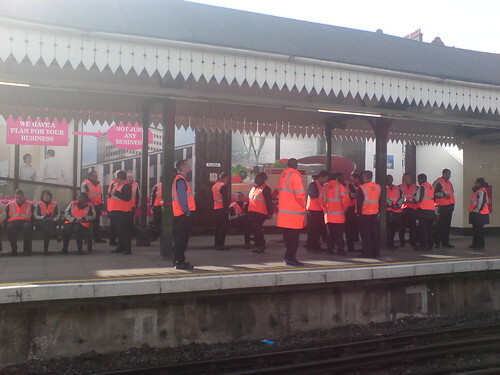 "Should the RMT go ahead with this action we will do all we can to minimise the disruption to the travelling public." We'll wait and see if he's right. Why are they never there when you need them? I have no idea what West Kensington did to deserve this, but I love this image by Coderkind. His caption is also brill "London Underground begin a massive anti fare-dodging campaign, but deploys all the agents to the one station" (and yes, yes, we know they're not revenue collectors, before some bright spark comments otherwise). 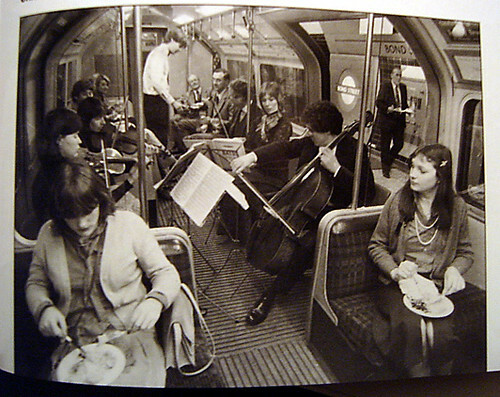 The picture was added to the Flickr London Tube group, of which I happen to be an admin of. So I'm going to try to highlight a picture from the group each week that catches my eye. Feel free to join the group if you've got any shots of the Tube you'd like to add. I've seen a number of video responses to the Angel tube escalator ski stunt, but this is one of my favourites. Designer Lee Washington thought that he would give the impression that Transport for London had created no skiing stickers for the escalators. printed them onto stickers. Last week he and a couple of mates went to Angel tube station put the stickers in conspicuous places and recorded the whole event for YouTube. I think it's quite a sound idea, remember the woman falling drunk through a glass roof, suing her landlord for not telling her to dance on it. You could almost see people trying to repeat the skiing stunt, and then suing TfL if they broke their neck in the process and complained that there were no signs saying it wasn't allowed. Lee's saving some uneccessary litigation. Without meaning to sound churlish, this is personally a bigger deal than getting into the Metro Blog Awards Travel shortlist (which is also very nice and thanks to everyone who nominated me). When you've used a blogging platform for over four years, it's great for the people who create the platform to recognise what you do with it. So many thanks Blogger team. Now I just need to bribe Ed Hall the travel judge at Metro, although, how it can compete with a blog by a Scottish night bus driver, is beyond me. Best of luck to my fellow shortlistees - Disgruntled Commuter - who's just been moaning about Metro readers, Phileas Blog (top name), and Mindhorn. Loving the look of disgust from the woman behind in April Angell's picture. She said "the mobile clubbing went on about an hour and half until the POLICE got involved!" 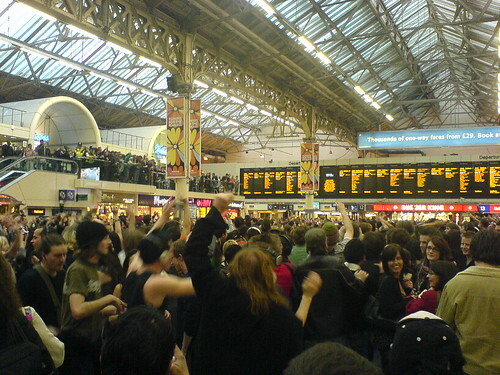 I'm always usually the last person to hear about these things, but for some reason I've found out that there's going to be a mass gathering of people with iPods, walkmans, personal stereos at Victoria Station tonight at 18.53. Don't ask me why it's 18.53 precisely.